A Year of Genius Hour – What Have I Learned? The learners in my class of 2017 are geniuses. For over a year now, these students have had a chance to shape the agenda of their learning, at least part of the time. Because of genius hour, my students are learning to care again about learning. They choose what they will learn based on what they wonder about, what they are good at, and what they are passionate about. It was a little over a year ago when I read a tweet by Angela Maiers about Daniel Pink‘s keynote address about motivation. I had seen the video “The Puzzle of Motivation“, and I had read his books A Whole New Mind and Drive. I had yet to fully translate the work to my students. I had an epiphany after I read Angela’s tweet and later this blog post by Daniel Pink, “Genius Hour: How 60 minutes a week can electrify your job.” I knew that according to Pink, we are motivated with autonomy, purpose, and mastery. If we want motivated students, why not let students become motivated by giving them autonomy to master what they wish for their purpose? It makes sense! Why NOT, indeed? So, our first genius “hour” was a three-hour block of time on the Wednesday morning before (American) Thanksgiving in 2011. It was such a thrill to watch the students fully engaged in purposeful learning, creating, producing, and mastering. They chose what they wanted to work on. Skeptics and future genius hour teachers alike also ask, “Do students take advantage of the freedom?” “Yes, fully!” I say with enthusiasm. They love the learning environment during genius hour. They use every moment wisely. In fact, one of my favorite things during our first genius hour morning was when the bell rang after the first period. (The bells continued to ring because our high school students were in regular classes that morning.) Initially when we heard the bell, I saw the look of disappointment on their faces. Then a look of sunshine and delighted cries of “Ooh, we don’t have to leave!” (Chances are good that most of us don’t normally hear that kind of reaction at the end of a first period class.) All morning students continued to learn, ignoring bells, only taking an occasional bathroom break. Now, to be sure, I know what people REALLY mean when they ask, “Do they take ‘advantage’ of the freedom?” They mean, “Do students screw around, instead of learning on their own?” To that I answer absolutely NOT. They have purpose. They have chosen what they want to learn; no one dictated it. They are given freedom to take as long as is needed to be satisfied with their learning. Now that we have genius hour each week for two periods (20% of our time together), I have students for whom that is not enough. They work on their genius hour projects during study halls, before school, at home, and during recesses. They are passionate because they have chosen purposeful learning. In an attempt to alleviate the problem of the 2 or 3 students in a class who struggle finding their genius, I’ve been asking them to reflect upon these three prompts. I keep working with them until they are willing and able to list their 30 “genius” ideas. (It is especially hard for some of them to admit to ten things they are good at). The lists become great conversation starters about what a learner might do for genius hour. Sir Ken Robinson explains in The Element that when someone doesn’t know how to read and write, we don’t assume they are incapable of literacy. Instead we know that they haven’t yet learned how to read and write. In a similar manner, he explains, when someone isn’t creative, we should not assume that they are incapable of creativity. We should assume they just need to be taught. I am trying to teach my students how to be creative. The next graphic shows the Universal Constructs from the Iowa Core. 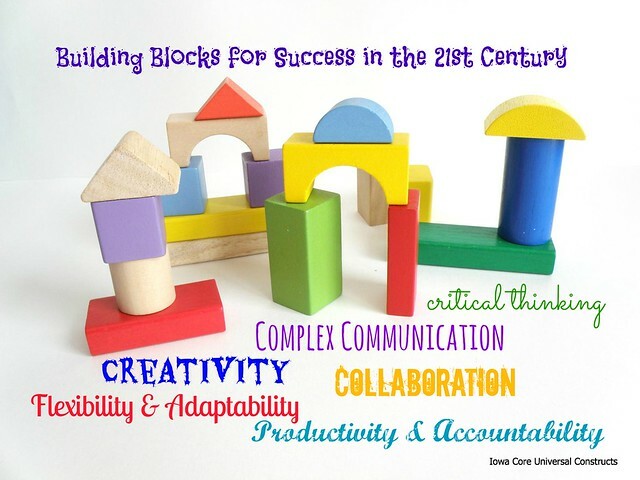 These building blocks for success in the 21st century align perfectly with genius hour learning. I have had one-on-one conferences with my less creative students, showing them these “building blocks for success” and holding them accountable for the work they do during genius hour. Sometimes it means having a learner write an analysis of why he chose to abandon an idea. Or helping another learner find a way to be flexible and adapt instead of abandoning her idea. I have listened to struggling small groups (limited to 2-3 people per group) as they figure out how to collaborate more effectively. Next up in my what-I-learned series is to make a video to show genius hour from my students’ perspective. For now, though, I will share a video created by Gallit Zvi, another genius hour leader. It shows great work by her geniuses. I used it to introduce genius hour to my new class this year. Genius Hour Blog Post Index – A list of posts from my genius hour beginnings and links to other teachers’ work. 2/15/13 – I did finish my latest “What is Genius Hour?” video. 3/18/13 – A comprehensive Genius Hour Livebinder by Joy Kirr. All images are shared with a CC Attribution license. You are free to use them, just click on image for more info. Thanks for all this detail and explanation! I’ll be referring back to this post many times in the next few months to make sure I soak it in fully! Thanks, Joy! I love learning with you! Thanks, Denise and Joy for inspiring me to keep going! Thanks so much! Yes, I find showing kids other kids’ work is a great motivation. Thanks for sharing your great resources too! I have been a much slower starter on genius hour than you! 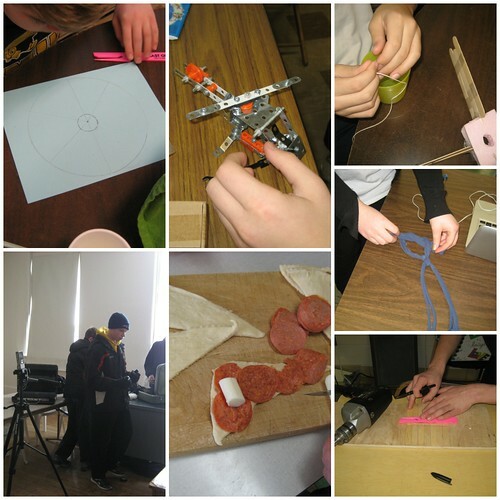 This post marks a year since I first heard of genius hour and thought it sounded great. I do have moments where I successfully provide space for my kids to explore what THEY want to learn, but I am at more like 2% rather than your 20%. You keep me inspired, though! Thanks, Laura, for taking the time to comment. I think we all have to find our way in genius hour. Definitely! I was doing that today, as I practiced what I said in this post. Helping students find their passion. 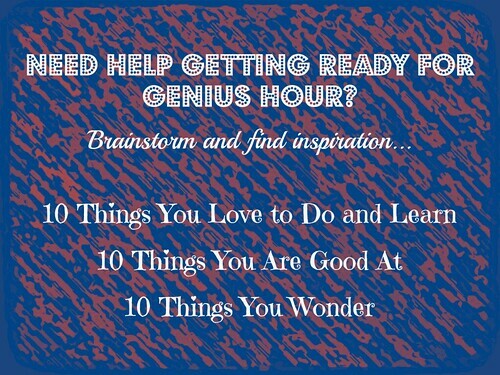 What will they do on our three-hour genius hour we have planned for next week? It’s hard sometimes for them to get it. Yours are getting a taste, so you are whetting their appetite for genius learning. You gotta love it! You always have a way of making everything sound so wonderful and so effortless! I know nothing is ever without challenges, but this is definitely the positive reminder I needed today after feeling so frustrated about our Genius Hour. I think ultimately it all comes down to being patient with the kids who need more time to process this concept of self directed learning. My students and I are still in the very early stages of this journey and we are learning together as we go. I need to help them be ok with attempting, failing, reflecting, and learning in the process. I’m sorry I make it sound so wonderful and effortless. Today if you would have been here, you wouldn’t have thought it so. I was crabby and impatient. Your comment helped me remember to be ok with “attempting, failing, reflecting, and learning in the process.” It’s not always easy, but we have some old school ways to unlearn, all of us, so it’s worth the struggle. Thanks for commenting today. I needed it. Love this! Both as a parent of elementary aged kids and as an Academic Technologist in HigherEd. As I learn more about and participate in MOOCs, I’ve been troubled by how we are currently preparing kids to be self directed learners and be able to function in a MOOC environment. It seems there is currently a big disconnect. But with activities such as “genius hour”, it really helps them get involved in things they are really interested in learning about and is structured in such a way that they can be successful. I thank you for visiting. I agree we must get students ready for the future of self-directed learning. I know many adults who are not yet ready for MOOCs or the self-directed learning of which you speak. For me, it seems easier to start with the young ones. Maybe if enough K-12 teachers are given students choices and time to work on their own learning, they will graduate from high school with a lifelong learner attitude and really be ready for college or the workplace or entrepreneurship or inventing or innovating or other genius work. My name is Leah and I am a student at the University of South Alabama. I am taking EDM 310 , a microcomputing systems course, required for my major in secondary education. In this class we learn to use internet resources for education and are required to post to our own blog and read others from students, teachers, and fellow students. I was assigned to read your blog and this was the most recent of your posts. I must say “Bravo” to you. Your use of this genius hour is absolutely wonderful. It certainly seems like one of those things that makes me want to say “Duhhhh! Why didn’t I think of that?” What better way to teach children something than to allow them to select the topic and carry that out? 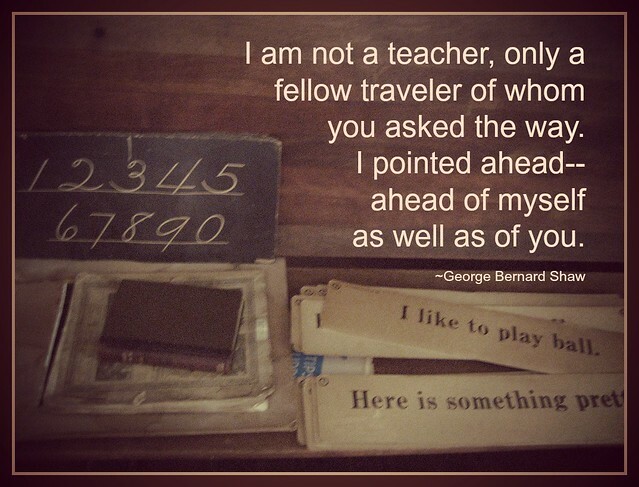 As a student on the way to becoming the teacher, I hope that I may someday be able to put your idea to use. Your blog is very intriguing, as is the title. I am looking forward to reading further into your posts, and those in the future. If you would like to take a look at my blog, or read my interest in yours in the upcoming week, you can find it at Leah Garvens’ EDM 310 Class Blog. I am very excited to have been assigned your blogs. They are absolutely inspiring, and I must thank you for that. It is so nice to meet you! I always look forward to meeting new students from Dr. Strange’s class. He does a great job exposing you to 21st century learning. You will not only learn valuable skills and tools, but if you dig deeply and pay attention, you’ll learn a whole philosophy of education because technology is not just an add-on to the old-school curriculum. Technology has opened education up to amazing possibilities of connection, collaboration, creation and more. Here is a typical question you will be asked on a job application: “What is your vision for teaching and learning in the 21st Century?” Open your mind and get ready for a great ride in EDM 310! Hi Denise, about 12 months ago I read Dan Pink’s book ‘Drive’ and was wondering about how to do a FedEx type of time with my students. Kept wondering and thinking about it then over the summer I joined ETMOOC and Twitter and read some tweets and posts about genius hour and now your post which has great info about how you’ve made it work in your classroom. Thank you for writing about Genius Hour. Now I know how I can get it going in my classroom.